It was such a treat to see Sara's face when she was introduced to the most foreign environment she has ever experienced! She couldn't get over the fact that every possible surface is ornamented. 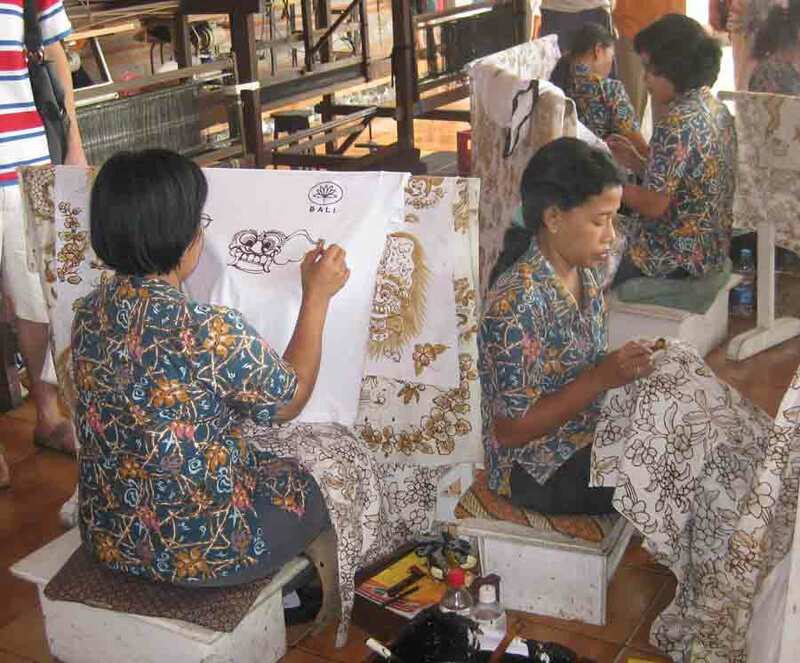 The Balinese are a nation of craftsmen. 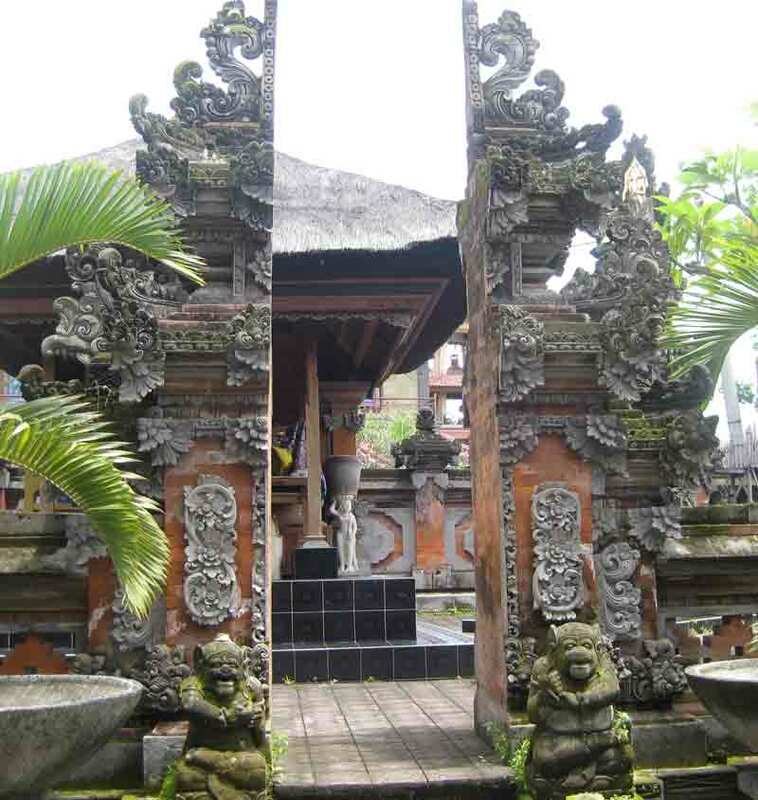 There are entire villages dedicated to various arts- stone carving, painting, wood carving, batik making and metalworking, to name a few. There are Hindu temples everywhere. There are public ones and private temples and shrines as well. Religion is a central part of everyday life. Incense and offerings for the gods are omnipresent. Each home and workplace has a small woven palm container placed in front of it filled with flowers. 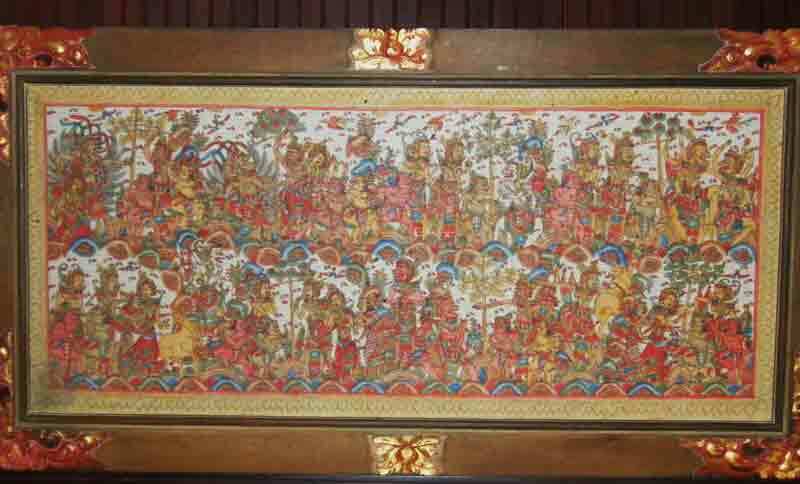 The lives of Hindu gods and heroes are depicted everywhere. Our driver, Madu (sp.?) was keen to show us his country and to explain its customs. Our first stop was a batik factory. Batik is created very much the same way as Ukrainian easter eggs- using a wax stylus to draw patterns, then dying the rest of the fabric and repeating the process for each colour used, working from the lightest to the darkest colours. It is so labour intensive, but most of the fabrics are sold very cheaply. We also visited a silversmith's factory and watched the women working on delicate and intricate jewellry. 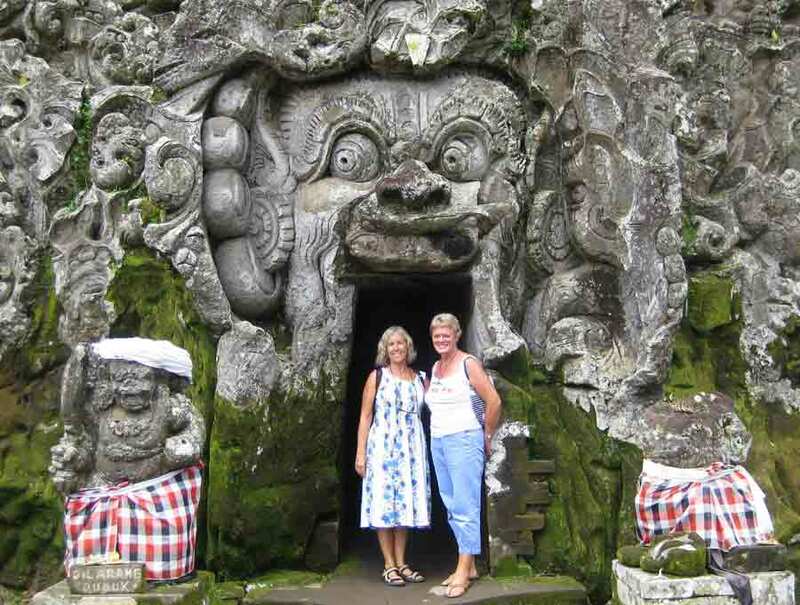 Our favourite stop of the day was at Goa-Gajah, the Elephant Cave. This is a grotto with a man-made cave for worshipping the chief Hindu gods of Shiva, Brahma and Vishnu. The view on the hike down is arresting. We were told it was lucky to bathe our faces in the sacred pool- and , of course, we did so. The entrance to the cave is very imposing. Inside are the niches for worshipping the gods. 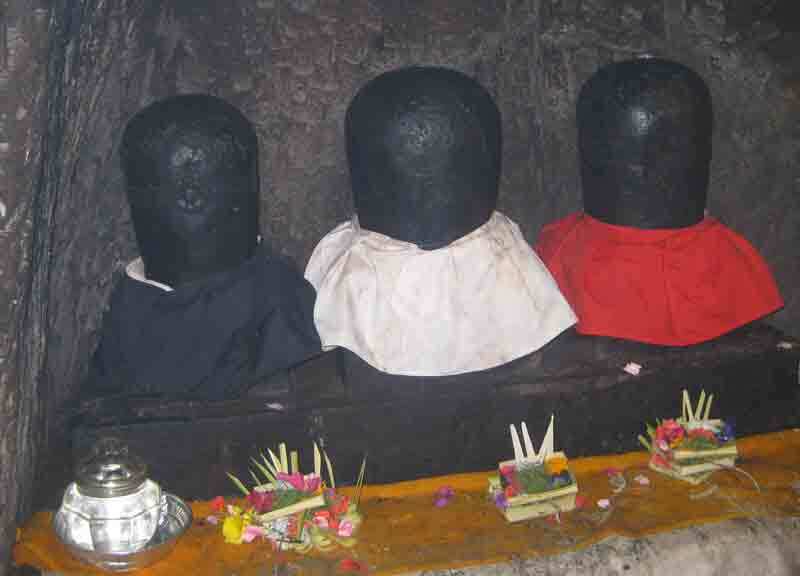 Shiva-Brahma-Vishnu statues. 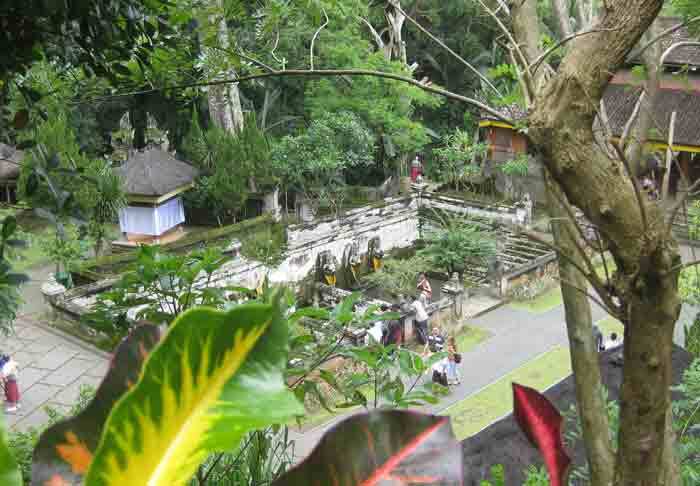 The colours dedicated to them are found in fabrics adorning religious sites throughout Bali. We wandered for a long time among the groves and peaceful gardens. A priest at one of the small temples showed us how to pray Hind style. We really did not want to tour by car for nine hours, as suggested by Madu and went to our absolutely gorgeous hotel instead. We stayed at the Tjampuhan Hotel and recommend it highly to everyone. We were wishing we could have stayed longer! Since it was off-season, the rates were quite low and the service impeccable. We felt like visiting royalty! 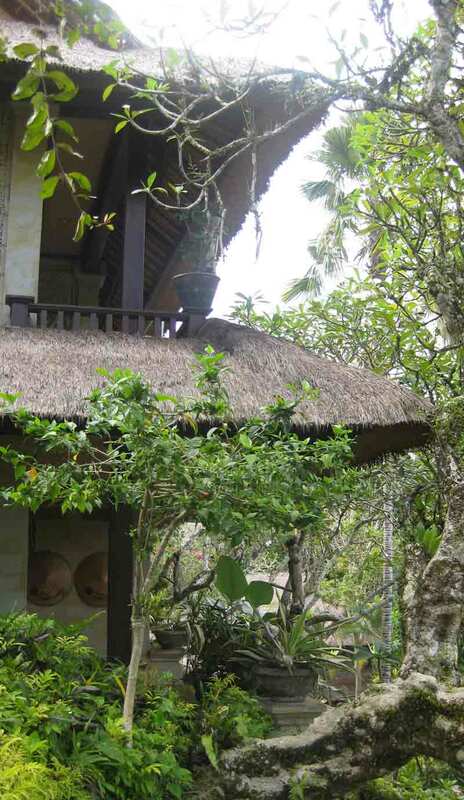 This is a view of our room on the second storey. some of our new "friends"
Our room was not terribly ornate, but was tastfully furnished with lots of room, a terrace and AIR CONDITIONING!!!! There was even a breakfast buffet included in our room rate. We took good advantage of this offer! Our intention that night was to attend a dance performance and were delighted to find the hotel could suggest an excellent one AND provide a free shuttle bus to get to it. The driver even abandoned the other passengers to make sure we purchased our tickets safely. 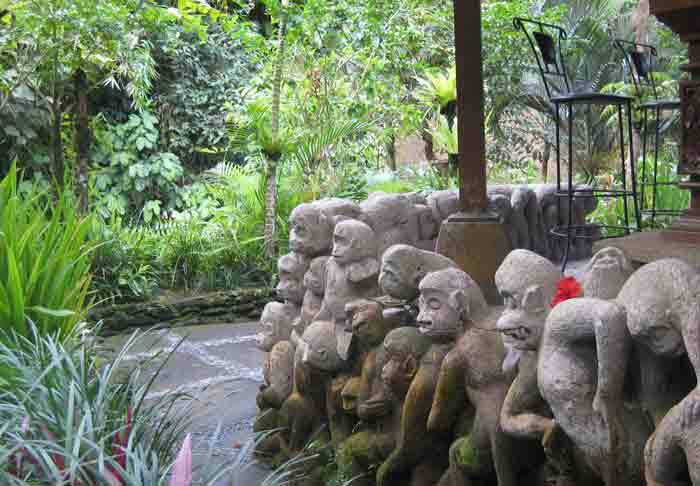 While waiting for the performance to start, we wandered about the area of Ubud nearest the temple and admired the handicrafts, an art gallery and even went into a DVD shop. It was HUGE and every DVD in it was pirated! We decided to eat after the dancing and stopped at an attractive restaurant. Even though Ubud is a major tourist centre, our meal came to only $6.00 for two of us!